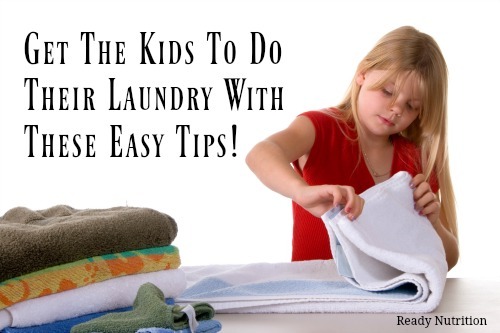 Get The Kids To Do Their Laundry With These Easy Tips! Doing the laundry is never exactly fun, but having my kids pitch in and help makes the job easier and it also teaches them independence and self-reliance. By planning/organizing a few things in advance, I’ve made the process of doing our laundry much easier for my little helpers. Teach Kids How to be Independent with these Easy Tips! This one may sound like a no-brainer, but in our consumerist/disposable society it’s easy to waste time, energy, and resources washing clothes that are still clean. In our house the rule is that aside from socks and underwear, we wear everything twice unless there is a stain on it (and here’s another tip–when we do art projects my kids wear their father’s old button down shirts over their clothes to avoid getting messy). A flannel shirt that has been worn over a t-shirt may be worn up to three times—and the same goes for jeans. There is simply no reason to wash clothes that are still clean. The less laundry you have overall, the less time you’ll spend doing it. Aside from that, I also stick to a laundry schedule. We wash clothes two days a week at the same time in the morning. My kids know that if they need something washed, they’d better get it into the laundry room on time. Long gone are the days where I would run a load (or two!) every day of the week, often washing clothes that were still completely clean. This one requires a little investment up front, but once it’s done you’ll be so happy with the results. In my family, each of us has a different assigned type/brand of sock. Mine are white with gray toes, my younger sons are light gray, my older sons are dark gray and my husbands are solid white. We ONLY have these socks and have gotten rid of the myriad patterns and styles that used to clog our drawers. When we do laundry, we just take all of the socks that belong to us and we put them in our drawers. No matching, no pairing, no worrying about lost socks. My kids are able to clearly see which socks belong to which people and the sorting is super simple. It’s been great! This one is in the same camp as #3. Since we do wash a lot of underwear each week, and since my sons are close in age, it can often be difficult to tell whose underwear is whose. We’ve assigned each of my sons a character (Batman for my older son and Spiderman for my younger son). Again, these are the ONLY underwear they wear. They love digging through the basket looking for their characters and there is never any squinting to read labels for sizing. The worst part about doing the laundry, in my opinion, is putting the clothes away. But I’ve found that my kids actually enjoy doing this part when they are given a little guidance. Printing out picture labels and taping them to the drawers allows kids to get involved and truly help. My kids aren’t that great at folding clothes yet, but I find that when they do the actual washing and drying (running the machines), the sorting of underwear and socks, and then put all of the folded clothes away, I cut the time I actually spend doing laundry in half. Besides that, my kids actually enjoy these tasks and they get a sense of accomplishment when they help our family.